// literal pool. It is literally a pool. // stuff for enabling interrupts. To save time, I’m going to assume you have a basic idea of what interrupts and exceptions are. If not, feel free to go google it. I’ll still be here when you get back, promise. ... Ready? OK, lets go. Usual disclaimer: I do not work for Sony. Despite the disturbing percentage of my shirts, jackets, and bookbags that are PlayStation dev-related, I have never worked for Sony. I do, however, have many friends that work at Sony, some of which I hope will call off the corporate lawyers. JayStation is in no way associated with Sony or PlayStation, and any stupid things I say represent only my own ineptitude and silliness. The basic premise is this. You place a table of eight branch instructions at memory location zero. It can be more or less than eight depending on the system. Each branch is a jump to a specific handler function. When certain exceptions occur, such as a memory exception or undefined instruction, the PC is set to some offset in your table, the branch at that location is executed, and we execute the corresponding handler, and (maybe) go back to what we were doing before the exception. Thats a lot of indirection so lets make it more concrete. undefined: This is a handler for undefined instructions, something you’d normally think is a bad thing, but can be quite useful when getting the CPU to store coprocessor registers for you on a context switch. For example, executing a NEON instruction with NEON support disabled. SVC: supervisor call. If your OS is running an application in user mode and the application wants to do something that requires supervisor access (syscall? ), you can’t just enter supervisor mode at will. You have to generate a supervisor interrupt, which puts you into supervisor mode, and then call your function from the handler. In previous versions of ARM this was SWI (software interrupt). data abort: depending on the configuration of the system, anything from an unaligned access to violating a page’s memory protection can trigger this abort. While JayStation2 OS doesn’t do any paging, this abort is also a good way to swap in memory. 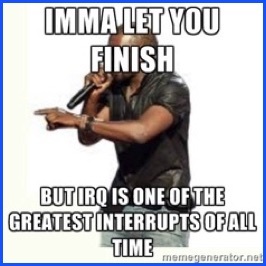 IRQ: interrupt request sent from various bits of the system. This can be from peripherals, devices, timers, etc. At the time of writing this, I am primarily using it for the ARM timer interrupt. Now lets get into a bit more detail on what happens when an interrupt occurs. 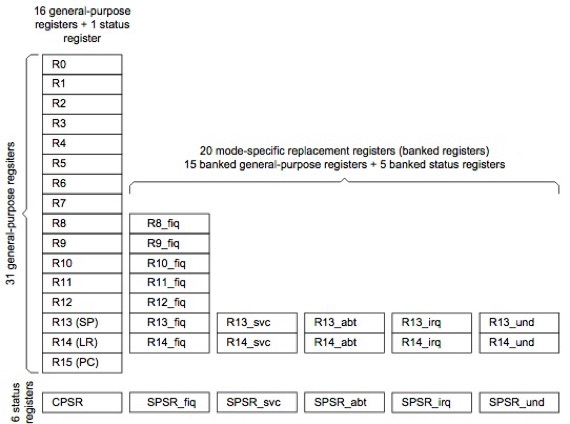 On exception the processor should automatically save the Current Process Status Register (CPSR) to the Saved Process Status Register (SPSR), sets LR to where we came from when the exception occurred minus some offset, set the CPSR to the exception mode, and set the PC to jump to the appropriate place in the interrupt vector table. Just to make that more concrete, imagine a process running in user mode triggers a supervisor call interrupt via syscall. Initially the CPSR will indicate user mode. We save that to the SPSR so we can restore it later. The processor then sets the CPSR to supervisor mode so your handler has the right mode to do what it needs to do. Now lets take a look at some sample handlers. That is my data abort handler. It prints out the fault reason, address, whether it was a read or write, decodes the instruction that caused the fault, and prints out the registers. You will also notice it does nothing to try and recover from the error, instead opting to hang forever in an infinite loop until the watchdog timer expires and the system is reset. Here is my IRQ handler. Exception address what it be . As you can see, r0 through r7 are common to all modes. FIQ has its own copy of r8 through r12, and everyone has their own SP and LR. This becomes useful later when we talk about context switches and threads.